What is the purpose of a Plastic Column Guard? 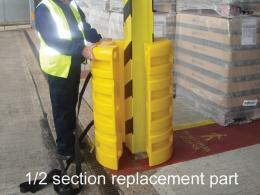 The yellow plastic column guard is used to wrap about a column or pillar for safety purposes. 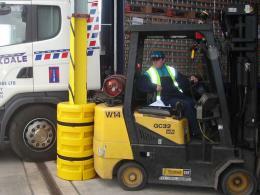 The column protector acts as a buffer if any vehicle or moving object collides with the surface. 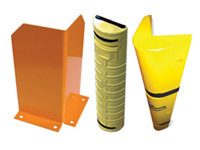 A plastic column protector will protect the vehicle in the event of a collision. If a vehicle is driving around a warehouse and accidentally hits a structural pillar in the middle of the warehouse, by installing a plastic pillar guard the damage done to the vehicle will be dramatically reduced or be avoided completely. It is a similar case when uses trucks or trolleys in the warehouse or forklift trucks. If any of these hit a column in a warehouse which is protected with a column guard then the damage will be minimal. Similarly, the wall or column itself is protected from any impact made by passing machinery or vehicles, which helps to keep the warehouse or building structurally sound. By using a plastic pillar protector in a warehouse then, in the event of a collision, the driver or person handling the vehicles or objects involved is also protected. The product features an air pressure release which cushions any impact made, and therefore reducing the risk of injury for employees or anyone operating in the area. Its yellow colour makes it noticeable, even in dim light, so it highlights the existence of pillars so people can take steps to avoid them. Where can a Plastic Column Guard be used? The most common place to use a plastic column protector is in a warehouse where vehicles and forklift trucks are moving around regularly. There are lots of obstacles and pillars involved in the structure of a warehouse, and so this provides the ideal place to install a column guard. A column guard is a useful piece of equipment to have in any site where there are columns and pillars. It is always advisable to protect any structural features of a building to avoid damage and potential collapse, so having a column guard here is recommended. An example of a site such as this is a car park, especially multi-story car parks which have multiple pillars in between parking spaces. In a multi-story car park there is a high volume of traffic passing through, so it is important to protect the structure, the vehicles and their drivers from harm by installing pillar protection. 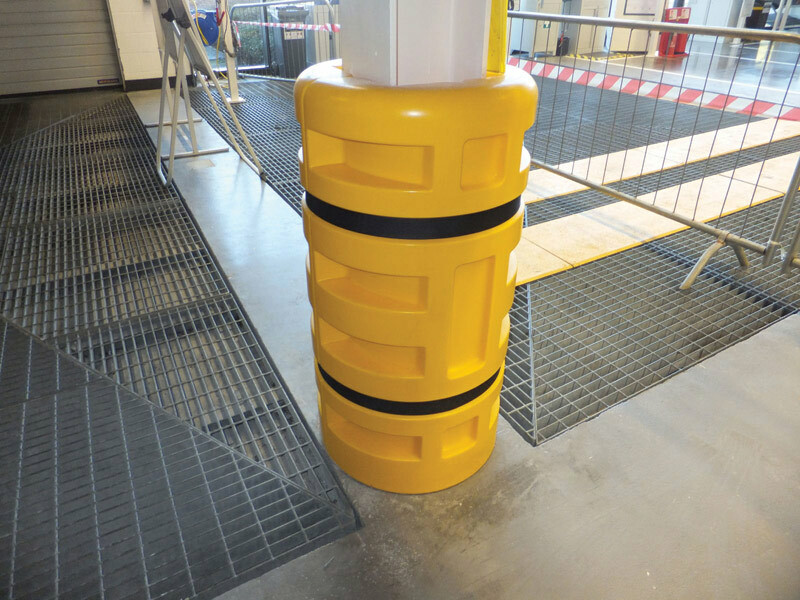 The plastic column guard is a yellow cylindrical shaped buffer made from rotationally moulded plastic. It is UV stabilised. There are no fixings included in this product as it is very easily to assemble; it simply fits over the base plates. The product weighs 23 kilograms in total. The product is available in two different sizes. The dimensions of the smaller size are as follows: 1100mm high x 600mm wide x 600mm deep and are fit columns that are 160mm x 160mm and 200mm x 200mm in size. The larger of the two products is the same dimensions as the smaller but is made to fit columns that are 250mm x 250mm and 300mm x 300mm. There is a half section replacement part also available. The Workplace Depot offers a standard one year guarantee on all parts and labour.